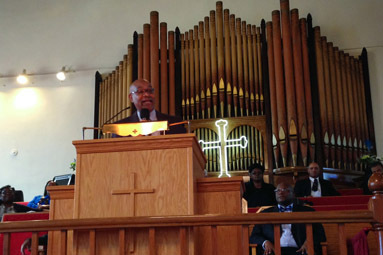 Simeon Wright, Emmett Till’s cousin, tells his eyewitness account Sunday of Till’s story to community members at an Evanston church. Wright said the story of his death is still being told inaccurately after almost 60 years. Almost 60 years have passed since the murder of Emmett Till, but people still do not tell his story accurately, Till’s cousin Simeon Wright said Sunday in Evanston. Through a retelling of his eyewitness account, Wright took an audience at Mount Zion Missionary Baptist Church, 1113 Clark St., back to the summer of 1955, when the 14-year-old Till went to visit his family in Mississippi. Wright was 12 at the time and said he was fascinated by the stories Till brought with him from Chicago. Wright recalled the day he was at Bryant’s Grocery & Meat Market when the store owner’s wife alleged Till grabbed her, put his arms around her and asked her on a date. None of these things happened, Wright said. Wright said Till whistled at the store owner’s wife and then ran into a car without speaking with the woman or her husband. A few days passed, and Till and his cousins had forgotten about their interaction with the store owner’s wife, Wright said. Early one morning, Wright was sleeping in the same bed as his cousin when he saw two white men — one holding a .45 caliber gun — take Till away, he said. Three days later, Till’s mutilated body was found in the Tallahatchie River. The neighbors kept silent out of fear for their own lives, Wright said. The trial took place on Sept. 19, 1955. Wright’s father, Mose Wright, pointed out the murderer on the stand despite urges from neighbors not to testify, he said. Although he did not testify on the stand, Simeon Wright was subpoenaed to identify the body because he had previously confirmed a ring found on the body was Till’s. Rev. Taurus Scurlock said he hoped hearing Till’s story would be a way for members of the community to move forward from recent acts of police violence. Evanston resident MacArthur Bickhem told The Daily he was 3 when he attended Emmett Till’s funeral in Chicago. When he approached the casket, Bickhem said his father lifted him up to see Till’s disfigured body. Encouraged by his wife, Wright wrote a book in 2010, “Simeon’s Story: An Eyewitness Account of the Kidnapping of Emmett Till,” because he was angered by inaccuracies he heard in the retelling of the story. Wright said for 20 years after the case, he didn’t talk about Till’s death, but decided to start telling his account so the truth could come out. Correction: A previous version of this article misstated Simeon Wright’s involvement in Emmett Till’s trial. Wright did not testify at the trial. The Daily regrets the error.